Wonderful multi-use hardy annual that we love for its flowers, seed heads, and edible seeds. 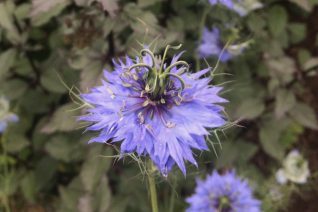 Love-in-a-Mist is the common name in reference to the mostly dark blue flowers that are ensconced in a haze of fine green stems. This is a charming cut flower. Upon finishing the ovaries transform to a ballon shaped structure full of yummy black seeds. You can then detach that as a cut flower as well. The dried black seeds have a peppery taste and are excellent sprinkled on salads. Be sure to sprinkle them on the ground where next year’s crop will be. Truth is once you plant this it is pretty much as permanent as a perennial, so reliable and prolific a re-seeding plant. The ferny seedlings are easy to spot, move or dispatch. Let them flow through your perennial borders. They make a wonderful addition to a cutting garden. Best in rich, open, disturbed soil with supplemental H20 all the way until seed are produced- though not entirely necessary it produces larger plants- and there fore stems, flowers, and more seeds. Blooms June-July. Full sun to light shade. VERY EASY.